Adewale Ojomo in chewier times against Wake Forest. Just in time to stare down the barrel of one of the toughest opening months in all of college football, Miami sophomore defensive end Adewale Ojomo is out of surgery to correct a broken jaw and drinking through a straw. How, exactly, the would-be impact player got that way is not exactly clear. Randy Shannon won't say more than that Ojomo was "horsing around" in the locker room, and boys will be boys when they get in the testosterone-fueled groove of oft-frustrating two-a-days. But reports persist that Ojomo was sucker-punched by a nameless rookie walk-on-with-a-death-wish who'd been repeatedly challenging Ojomo to a wrestling match. That certainly puts a different light on the affair (and what happens to the walk-on -- our bet is "body in canal"). It's safe to assume that rumors are at least partially true. Shannon, like every other college coach, would rather be banished to the Magic Jack St. Pete Bowl (it's real, and it's spectacularly dull) forever than confirm to media that players are involved in skirmishes behind the scenes -- ask Chris Rainey about tussling with Percy Harvin, and then ask Urban Meyer about it. The truth is, it's an extremely common occurrence in football, whether it be college, high school, or Dolphins. That doesn't make it okay, or smart. 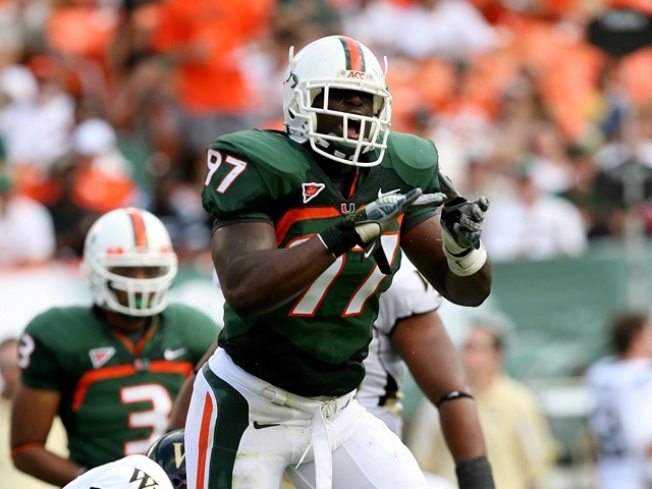 The Hurricanes are deep at defensive end, but nicks and more left five ends on the sidelines for yesterday's practice. For Ojomo, the weight loss that comes from having a jaw wired shut for five weeks means he's not likely to bounce right back once the wires come off. He's more likely done for the season, which means the freakishly strong Allen Bailey could be moved back to end from tackle and fellow ends Marcus Robinson and Eric Moncur should now be encased in bubble wrap at all times. At least Ojomo can still hold his head high -- being sucker-punched isn't nearly as embarrassing as what happened to former Hurricanes QB Kyle Wright, who missed a chunk of the 2004 season after losing a fight to a bee.